This post is really dirty! Two weekends ago, along with the support of my fabulous friends, I participated in and completed my very first 5k! The San Diego Mud Run is a 5k with obstacles aka not flat and easy! Mud pits, "water" holes, mud walls, tunnels, one very long and very steep hill, water hoses, trenches, and hurdles are spread out across the course. The first thing you do to prepare for the run (besides the months of training right? Right) is strap down your shoes with duck tape. This may seem silly but trust me, it helps. With our shoes thoroughly secured and adorable, we head over to the start line and wait for it all to begin. After a lap to get us moving we head down the hill and straight for the mud. Once you hit it, the real fun begins! At first everyone is screaming and laughing. There's a bit of a wait as the pack starts to thin out. We watched as people ran through, splattering mud as they went, getting the first bit of brown on their shoes, shins, and thighs. 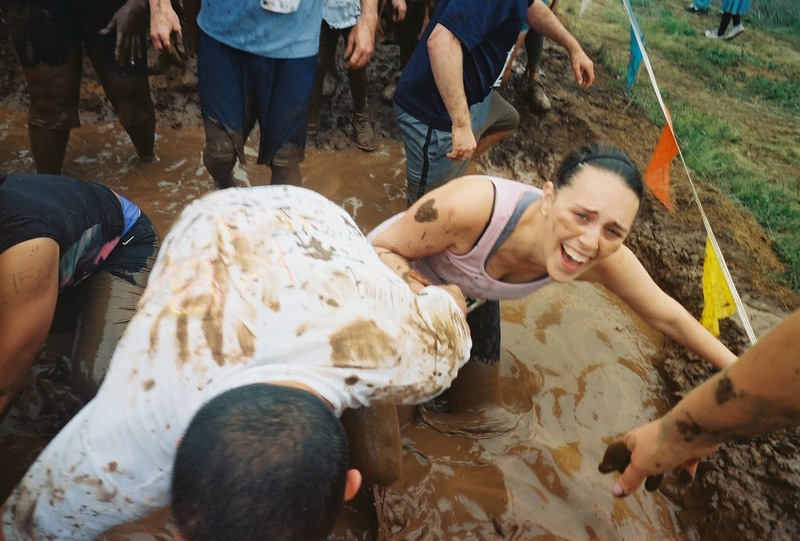 As I went through the second mud pit I managed, even as 6 foot tall woman, to step in the deepest hole and plunge waist deep into the muddy water. Off to an excellent start! After that it just gets more and more dirty! 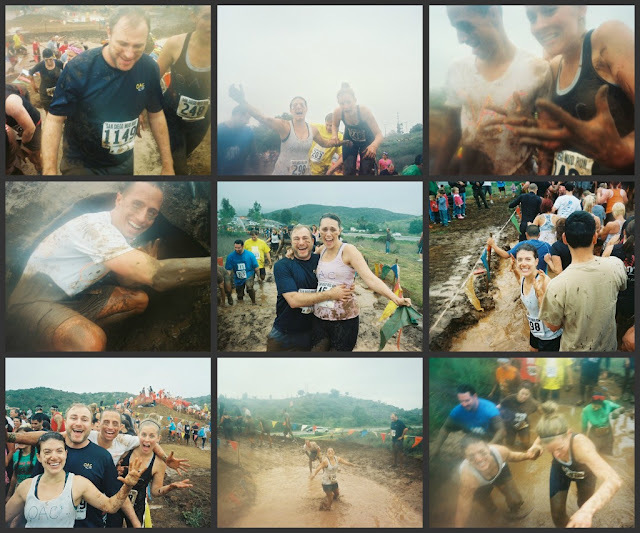 When we first signed up for the Mud Run I don't know that any of us had anticipated just how fun and muddy it would be. A couple of hoses, some dirt, mud on your shoes and legs maybe but nothing like this! Thank goodness we had the foresight to bring a disposable camera with us. Those pictures are classic. I was and still am beyond excited I did this! Not to mention proud of myself. Not only because it is 1/3 of Goal #1 from my 27 Goals for 27 but because I am a lazy person! I'm not a runner. Last time I did any real strenuous activity, which was a hike up a mountain, I threw up. Swear to you. So when I say I feel OVERJOYED that I was able to finish this race in one piece I hope you believe my sincerity. I love love love them! Kimi, Greg, Lisa, and Rob, thanks for the helping hands, the encourgement, and the occasional waiting up for me! You guys are my favorites! The race was challenging but so fun. I encourage all to try a mud run. Even if you arent a runner like me. Trust me, if I can do it so can you! I have another 5k here in a couple weeks that I'll be sharing with you as well: The SoCal Color Run. Another messy, though slightly more colorful, 5k that'll be running with my friend Lisa again. After that I'll have one more 5k to go and goal #1 will be complete! It feels good to accomplish things you never thought you could do. Looking for the same results on the next one. That is so awesome! I have a bunch of friends who have done this in MA. I've thought about doing it but haven't yet. I am doing the New England Color Run in July and I can't wait. It will be my first 5K ever and it sounds like so much fun! I can't wait to hear your experience. WEll, this is the dirtiest I've ever seen you, and that includes the day you returned from Katherine Michael's week long camp without a bath. Thanks for the comment on Pinterest about the color run! 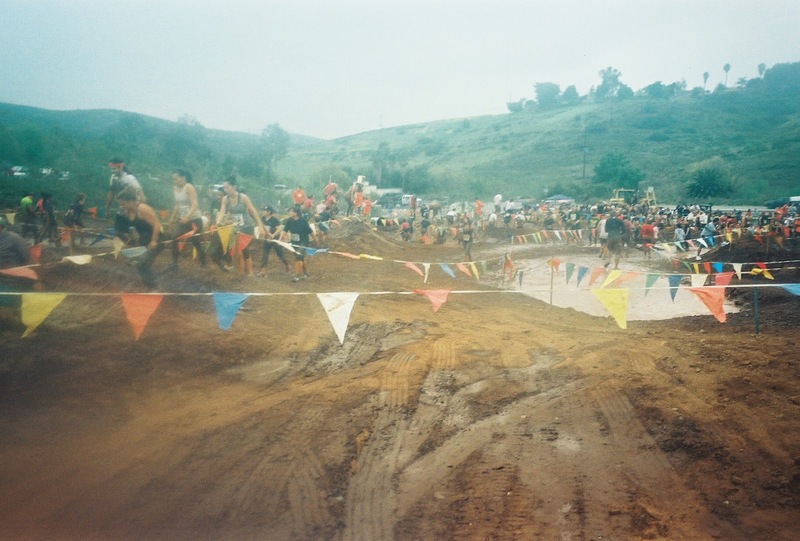 The mud run looks like it might even be more fun! 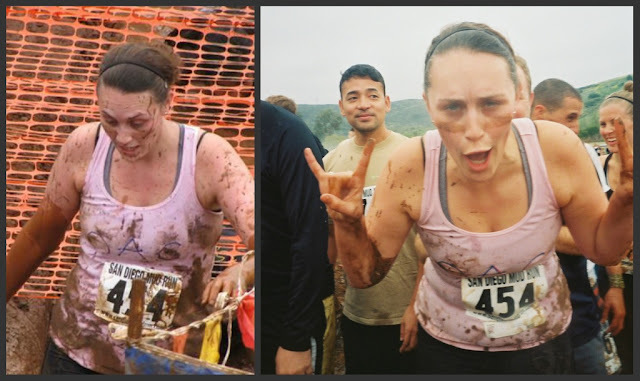 I like 5k where I get dirty! Mud or color! I would say the Mud Run was a bit more fun cause it was tougher and involved a bit more. But i'd say just do both!